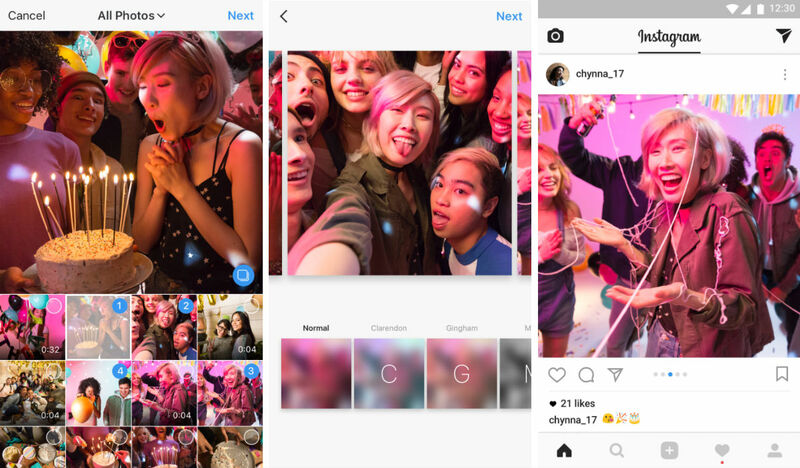 Inside version 10.9 for Android and iOS devices, Instagram is ready to allow regular users, and not just paying advertisers, to bunch multiple photos and videos into a single post. Just as we reported on February 1, this change is essential for those who have multiple photos or videos they want to share, but don’t want to spam your followers’ timeline. As you scroll through your gallery, you’ll notice a new icon that indicates a multi-photo (or video) option. Once you have the photos picked out, make sure they’re properly filtered, then post away. It’s simple and effective. When uploading to your feed, you’ll see a new icon to select multiple photos and videos. You can tap and hold to change the order, apply a filter to everything at once or edit one by one. These posts have a single caption and are square-only for now. On your profile grid, you’ll notice the first photo or video of your post has a little icon, which means there’s more to see. As Instagram states, your photos will be limited to a square view, for now. I have been loving the portrait-style photos, so hopefully that change is implemented somewhat soon. Have at it, friends. Oh, and don’t forget to follow DL on IG!